Acknowledgement: This work has been summarized using the W. W. Norton 2003 edition. Quotations are for the most part taken from that work, as are paraphrases of its commentary. Impression: This is a short, concise, but important book. The author has written many similar works since the 1970s, and is currently head of the Earth Policy Institute which he founded. Although the book is sometimes repetitive and seems a little patched together from previous articles and books, it nevertheless skillfully summarizes many of the ecological and environmental issues that threaten our Earth and our future. The outlook is consistently international and global in scope, and not confined to any one country. The subject matter presented has been carefully selected and honed to maximize political persuasiveness and to minimize controversy. Compared to Al Gore's passionate, spiritual, and at times deeply personal Earth in the Balance (1993), it is quite similar in its subject matter, but more polished and selective in its focus. For example, it sidesteps the failure of clergy and certain organized religions to substantively address the problems of overpopulation, and it studiously avoids direct criticism of the profound neglect of environmental issues by President Bush. Everyone should read this book and try to act to bring about the needed changes the author presents so clearly. However, individuals can only accomplish so much--informed and forward-looking responsible national leadership is the missing ingredient to date. Government must take the lead and establish new policies and priorities such as are discussed here. Even Al Gore's subsequent track record while Vice President and as candidate for president is disappointing in this regard. The following presents a skeleton summary of the major topics presented in this book. Commentary or editorialization by MCM is enclosed in [square brackets]. The dedication is to Orville L. Freeman, former Secretary of Agriculture. The Preface discusses his 2001 book, Eco-Economy: Building and Economy for the Earth, but the current book argues for more urgent action at wartime speed. He acknowledges that to keep the book short, he has largely omitted discussion of the loss of biological diversity and has given only passing mention to problems of water pollution or environmental education. World population has doubled and the world economy has expanded by 7x in the past 50 years. We have a "bubble economy" that is using resources at an unsustainable rate and that will collapse without drastic intervention. Major concerns are overgrazing rangeland, overpumping aquifers, draining rivers dry, overfishing the oceans, destroying habitat, increasing CO2 release leading to global warming, the first mass extinctions of species since 65 million years ago, soil erosion and expanding deserts, etc. As of about 1980, we are consuming not just the interest earned by nature but also the principal of our natural endowment, and this will lead to environmental bankruptcy. We are currently (as of 1999) exceeding nature's capacity by about 20%, perhaps 24% by 2003. Discussion of other bubble economies such as Japan, the NASDAQ. World population grew from 2.5 billion in 1950 to 6.1 billion in 2000, exceeding that of the past 40 million years. Our global economic output rose from $7 trillion in 1950 to $46 trillion in 2000. Population growth and increasing prosperity promotes increased consumption of grain, tripling demand from 1950 to 2000. Producing this grain has accelerated topsoil erosion. Water use has tripled, causing water tables to fall and wells to dry up. Fossil fuel consumption has gone up 4x, and CO2 emitted exceeds natural fixation capacity, leading to the rise in atmospheric CO2 from 316 PPM in 1959 to 369 in 2000. Food such as grain will be in increasingly short supply--in the years 2000-2002, the grain harvest fell short of consumption (for example, in 2002 the grain harvest of 1807 million tons fell 5% short). Farmers are unlikely to be able to close this gap without causing further environmental degradation. Progress toward reducing world hunger has essentially halted--the number of undernourished people in 2000 is estimated by the UN at 840 million. Global warming is increasingly evident, causes reduced crop yields. Photosynthesis for many crops including corn slows to zero at 37° C. Each 1 degree Celsius rise in temperature above the optimal crop temperature during the growing season reduces yields by 10%. China as an example. Overpumping of aquifers: The water tables are falling in scores of countries (including Northern China, the US, and India) due to widespread overpumping using powerful diesel and electric pumps. Other countries affected include Pakistan, Iran, and Mexico. This will eventually lead to water scarcity and cutbacks in grain harvest. China's problems include also overgrazing rangeland (especially problematic are sheep and goats), overcutting forests, loss of protective vegetation and increasing dust bowls, and expanding deserts (especially the Gobi as well as in Gansu and Inner Mongolia). Millions of tons of topsoil can be lost to winds in a single day, depositing dust on distant countries including S. Korea, Japan, and even the US. These adverse changes will force many millions of internal migrants and environmental refugees, as well as other hardships. Iran and Egypt import 40% of their grain; Algeria, Japan, S Korea, and Taiwan import 70%; and Israel and Yemen import 90%. The US, Canada, France, Australia, Argentina, and Thailand are net grain exporters and together account for 90% of grain exports. Rising Chinese demand (its current grain shortfall is 40 million tons/year) will destabilize world grain markets eventually and lead to life-threatening rises in grain prices. Canada in 2002 stopped exporting grain. Shortages like these have caused or will lead to millions of environmental refugees, particularly in China, Nigeria, Iran, Yemen, Quetta (in Pakistan's Baluchistan province). Hunger will be on the rise, may lead to social breakdown and anarchy (such as is evident in Somalia, Afghanistan, and the Dem. Rep. of the Congo). The author expands on the topics of overpumping aquifers and rivers running dry (such as the Colorado, the Yellow River in China, Amu Darya that fed the Aral Sea, the Nile, the Indus, and the Ganges. Grain requires 1000x times it weight in water to be grown (whereas steel production requires only 14x its weight in water). Water consumed indirectly for food production can reach 4,000 liters per day. Water is being diverted to cities and to industry as higher and less consuming uses, shorting agriculture as a result. Deep (fossil) aquifers are composed of fossil water and are nonreplenishable--pumping from them is akin to mining. Examples include the Ogallala under the Great Plains and the deep aquifers under N China and Saudi Arabia. Replenishable aquifers are usually shallow and are replenished at the rate of recharge. The countries most severely affected by aquifer overpumping (in order of population) are China, India, the US, Pakistan, Mexico, Iran, S Korea, Morocco, Saudi Arabia, Yemen, Syria, Tunisia, Israel, and Jordan, comprising together 3.2 billion people. The average deep aquifer level in N China dropped 2.9 meters just in year 2000. Some deep wells near Beijing now extend to 1000 meters below the surface in order to tap fresh water and supply crops. Chinese grain harvest (except corn) is falling: (1) from 123 million tons of wheat in 1997 to 87 million in 2003, (2) from 140 million tons of rice in 1997 to 121 million in 2003; and (3) from 392 million tons of all grains in 1988 to 338 million in 2003. China is overpumping the basins of the Hai, the Huai, and the Yellow River. India is overpumping the Punjab, Haryana, Gujarat, and other regions, and water shortages could eventually cause a decline in grain yields of 25%. In Gujarat, the water table has fallen from 15 meters deep to 400 meters. In Texas, Oklahoma, and Kansas, leading grain states, the water table has fallen by more than 30 meters, and many wells have gone dry in the southern Great Plains. Other countries are especially affected, particularly Yemen. Rivers run dry from damming, diversion for irrigation, and loss of springs when aquifers have diminished that would otherwise recharge them. Examples include the Colorado in the US. The Amy Darya no longer recharges the Aral Sea, whose volume of water has dropped by 83%. The Yellow River in China has failed to reach the sea in parts of each year since 1985. The Nile River's discharge into the Mediterranean has declined from 32 billion m3 to less than 2 billion m3 as a result of the Aswan Dam and other diversions. The Indus, Mekong, Tigris, and Euphrates are also affected, inasmuch as virtually all their water is being used. Countries forced to import their grain are increasingly vulnerable. Water shortages are increasingly putting countries in competition and will lead to wars. In many countries, food production is artificially maintained by unsustainable depletion of natural resources such as fossil water, and collapse of these bubble economies is inevitable. Texas, Kansas, and Nebraska get 70-90% of their irrigation water from the fossil Ogallala aquifer, a nonrenewable resource which is being depleted. Other countries depleting their aquifers for food are cited. Loss of topsoil. Mayan historical example. US dust bowl. Silting of reservoirs. Land productivity falls with loss of soil. Ethiopia is losing 1 billion tons/year of topsoil, India 4.7 billion. Nepal, China also affected. Role of overplowing and tilling of marginal soils or sloping lands. Desertification is caused by clearing of vegetation and forests which serves as natural windbreaks, overplowing, overgrazing, firewood gathering, loss through dust storms of soils, etc. Examples cited in Africa, Nigeria, Kenya, Iran, Afghanistan, China, Inner Mongolia, etc. Prime crop land is being paved over for autos, since both farms and roads prefer flat well-drained lands. One auto requires about 0.2 acres in land paved, often at the expense of crop land. Future for China, India, and other countries where there is not enough land to provide for the projected number of automobiles as well as crop land needed to meet food requirements. Soy oil and soy meal are major food and livestock feed products. Soybean oil dominates world vegetable oil economy. The US soy harvest in 2002 was worth $13 billion, 2x that of wheat. Meeting rising soybean demand will require more land. World grain areas peaked in 1981 at 732 million hectares and have declined to 647 in 2002. Declines have occurred due to abandonment of marginal soils, soil loss, paving and population expansion, conversion to fish ponds, etc. Thou shalt inherit the Holy Earth as a faithful steward, conserving its resources and productivity from generation to generation. that thy descendents may have abundance forever. and thy descendents shall decrease and live in poverty or perish from off the face of the earth. 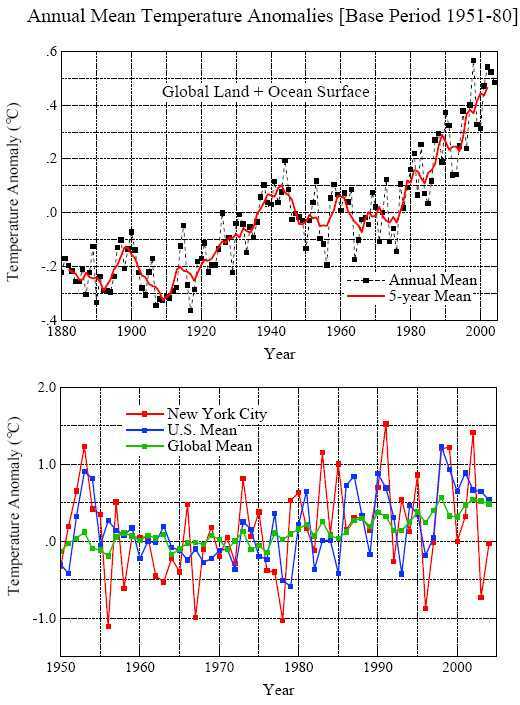 Heat waves are increasing in frequency and severity. Ice is melting, storms are increasing. 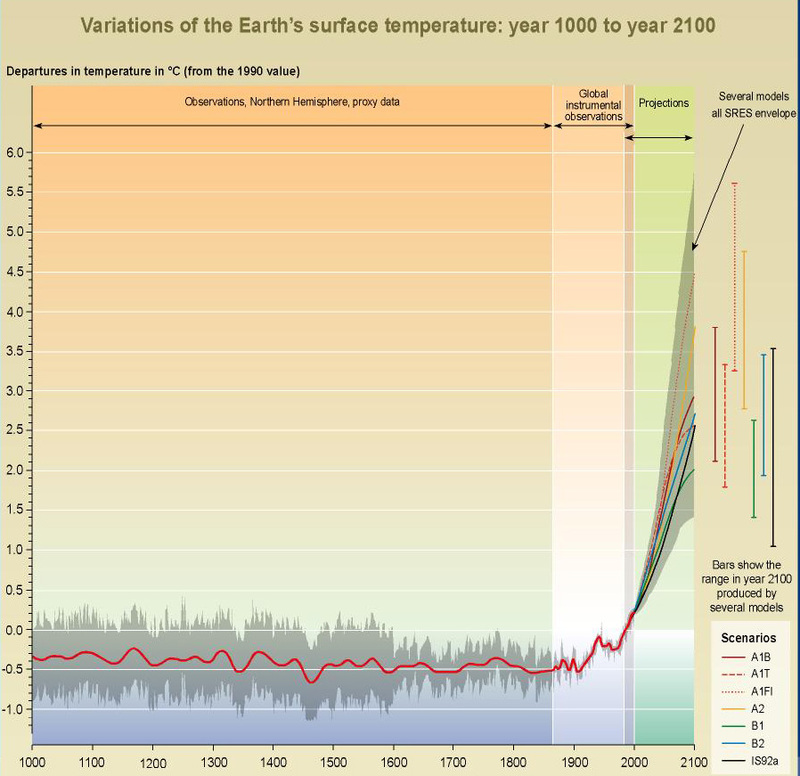 A rise in the 21st century of between 1.4 to 5.8 °C is projected by the Intergovernmental Panel on Climate Change (2nd graph to right). Rising temperatures decrease crop yields for rice, wheat and corn beyond a maximal optimal temperature that varies from 34 to 37 degrees C. This is due to plant dehydration and other heat stresses. Agriculture might be moved to cooler northern regions, but these tend to have poor soils. Snow and ice reservoirs of water are being depleted by global warming. There is increased winter runoff of water, when it is not needed and causes flooding, and diminished runoff of ice melt in the spring and summer when it is needed. The rising of the seas from melting of glacial ice, Greenland and Antarctic ice caps, Arctic sea ice, and other ice melting threatens many coastal areas in the world, due to a projected rise of somewhere between 4-35 inches. These include many low islands, Bangladesh, rice growing areas of India, Thailand, Indonesia, and other Asian countires, lower Manhattan, Washington D.C., New Orleans, etc. Destructive storms are increasing in frequency and severity, causing wind damage, flooding, mudslides, and other forms of widespread destruction. The economic costs of storms are increasing and threaten the viability of the reinsurance industry. The costs of global warming are being subsidized by subsidies for fossil fuel consumption, stimulated by powerful gas and oil lobbies. 1.2 billion people are undernourished according to the World Health Organization. Life Expectancy is decreasing dramatically in sub-Saharan Africa due to the HIV epidemic, which is having devastating effects on adult workers and their children, etc. This epidemic, along with endemic tuberculosis and malaria, should not be simply watched with "a kind of pathological equanimity". Poverty and hunger are greatest in India and Africa. They contribute to low birth weight infants, greater disease, reduced productivity. There is a great need for potable water, improved hygiene. Illiteracy affects 875 million adults, 60% of them women, and contributes to poverty. Proceeding as we are doing without radical redirection constitutes Plan A, no change at all, and will lead to eventual bursting of the environmental bubble and severe consequences. The rate of environmental degradation is accelerating. Species are going extinct at an alarming rate. Pollution and toxic wastes are rapidly increasing. Population growth in excess of resources leads to conflicts, contributing to the genocide in Rwanda, as well as tensions in Nigeria, India, etc. Water competition among countries is increasing: Egypt, Sudan, and Ethiopia; Turkey, Syria, and Iraq; the 5 Stans sharing the Aral Sea basin, etc. Needed solutions include the following: Adopt realistic prices for water, use a sliding scale that starts at a low base rate. Meter the use of ground and river water. Provide economic incentives for more efficient water use. Place control of water in the hands of local associations. Raise water productivity (kg grain per ton of water used) with appropriate selection of crops (e.g., wheat rather than rice, sorghum rather than corn), reduce seepage, employ drip irrigation, laser leveling of land, etc. Harvest rain water, terrace hill sides to reduce runoff and increase rain absorption for recharging aquifers. Reduce nonfarm uses of water to wash away wastes including toxic pollutants. Diminish sewage by using composting toilets. Recycle sewage water to potable water [but can drug contaminants be fully removed?] High cost of desalination plants ($1 - $2 per cubic meter to desalt sea water). Applying more fertilizer will not generally be the solution. Crop yields are not generally rising as much as in the past. Increasing yields can be done by planting leguminous trees, employing multiple cropping (e.g., raising winter wheat and summer corn, or wheat plus rice, or wheat plus soybeans). Also need to produce animal protein more efficiently. Cattle in feedlots require 7 kg of grain to produce 1 kg gain in live weight, whereas pigs require 4 kg, poultry require only 2 kg, and herbivorous farmed fish (such as tilapia, catfish, and carp) require less than 2 kg. Aquaculture has considerable potential due to the high efficiency of converting feed into protein. China is the leading producer of farmed fish. Although public controversy exists about farming carnivorous salmon and shrimp, world aquaculture is dominated by herbivorous species and shellfish, and this is where the potential for growth lies. Use of crop residues for animal (cattle, water buffalo) feed is increasing especially in India, which has eclipsed the US in milk production as a result. Ammoniation of these residues can facilitate ruminant digestion. Wind erosion can be countered by planting tree shelterbelts, by strip cropping, and by paying farmers to plant trees. Water erosion can be reduced by terracing, conservation tillage (no tillage or minimal tillage), permanent vegetative covers, curbs on urban sprawl and the dominance of the automobile. People should eat down the food chain, somewhere in the middle like the Italians, for whom meat is more a condiment than a main dish. Sheep and goats destroy grass and vegetation, so a shift to dairy cattle is recommended. Reduce overgrazing. Shift from fuel wood to solar cookers or wind-generated electricity. Tony Blair of Britain has joined Sweden's PM in urging reducing CO2 emissions by 60% by 2050, much greater than the 5% by 2012 called for by the Kyoto Protocol. Canada is phasing out coal-fired power plants which lead to acid rain and mercury pollution. Germany has set the pace in reducing CO2 emissions by 40% by 2020. The US so far is lagging, due to a lack of leadership. It would be entirely feasible to cut in half CO2 emissions by 2015. Improving energy efficiency is a needed goal. Methods include: improved household appliance energy efficiency, improved building and home energy efficiency, banning nonrefillable beverage containers (aluminum is more expensive than refillable glass), switching to compact fluorescent lighting, doubling the fuel efficiency of autos (hybrid engines), redesigning urban transport for greater efficiency (e.g., light rail, congestion tax), wind farm generation of electricity (cost in 2001 was as low as 4 cents per kWh), conversion to hydrogen fuel cell power for building and autos, shifting subsidies from petroleum consumption to use of wind and hydrogen power, etc., photovoltaic cell conversion of sun to electricity, and geothermal energy for heating and power generation. The hydrogen economy. Problems of storage of hydrogen especially in autos. Who will provide the hydrogen? Cutting carbon emission with public transport and reduction of autos also can be fostered by restructuring incentives and subsidies. Two-way or net metering can help individuals operate wind power generators that feed electricity back into the grid. This can help to reduce coal power generation with resultant CO2 emission and mercury pollution. Must slow population growth, so that medium projection of 8.9 billion by 2050 does not come true. Need effective and universal birth control, reproductive health, and family planning. US President must advocate a policy of 2 children per couple. Must have universal basic education, especially of poor girls, more teacher training. Must promote basic health initiatives, especially for infectious diseases in third world countries, assisted by reducing hunger (which predisposes to health problems and disease vulnerability). Provide better water supplies, reduce auto accidents, discourage smoking, provide school lunches in poor countries, develop women, infants, and children (WIC) programs. Some of these efforts will help to reduce the conditions that breed terrorism. Governments implementing some of these programs can experience productivity rises and other social benefits instead of worsening "demographic fatigue". The total cost to implement a global set of basic social goals is $62 billion per year [less than the cost to date of the Iraq war], and includes $15 billion for universal primary education, $4 billion for adult literacy, $10 billion for family planning, $2 billion for closing the condom gap, $6 billion for school lunches, $4 billion for WIC assistance in the 44 poorest countries, and $21 billion for universal basic health care. The US would contribute perhaps $20 billion, and other countries would provide the rest. A massive mobilization is needed at wartime speed, just as the US did after Pearl Harbor. Restructure the tax system to reduce destructive activities and promote more environmentally sound initiatives. Slow world population growth to stabilize at 7.5 billion people. Shift to a hydrogen based economy. Stabilize water tables, reduce soil erosion. By 1942, the US made the greatest expansion of industrial output in the nation's history, complete with auto and gasoline rationing. Our markets must include in prices the indirect costs of providing goods and services deriving from consuming nonrenewable resources. Set cigarette and gasoline prices to reflect the real costs to society including future health problems. Gasoline should be $3-8/gallon. Plant more trees. Tax carbon burning, tax emissions of heavy metals, tax garbage production, tax auto congestion in urban cores, tax CFCs and energy consumption. Shift subsidies to more desirable goals than petroleum use. We in the US need great political leaders now, such as Tony Blair. Corporate leadership is also needed. US focus on military buildup is counterproductive: we spent 343 billion dollars in 2002 compared to 205 for US allies combined, 60 for Russia, 42 for China, 12 for Iran Iraq and N Korea, whereas much world improvement could be purchased for 62 billion per year as outlined above. Industrialized countries should spend a ratio of 1:7 for foreign aid versus defense--this means that the US should spend 48 billion in foreign aid. These goals are doable, we must adopt Plan B or suffer the consequences of our inaction.